Editor’s note: the following story contains information and depictions that may be disturbing to some readers. Sylvia Liken’s story has gained immense media attention but is likely new and unheard of for younger generations. Her story has spawned books like The Basement and the Showtime movie, An American Crime. 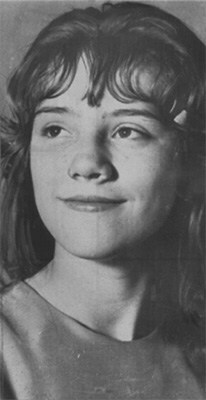 Born in 1949 in Lebanon, Indiana, Sylvia Likens was the middle child of two sets of fraternal twins. Born into an unstable marriage with frequent moves and financial struggles, Sylvia was sent with her younger sister Jenny to live with friend-of-the-family Gertrude Baniszewski in Indianapolis at her east New York Street home while their parents found jobs working at carnivals. This kind of boarding arrangement was not uncommon in the 1960s. According to Indianapolis police reports, court testimony, and witness accounts from around the neighborhood, it didn’t take long for Baniszewski, a woman described as “depressed, haggard, addicted to pills”, and “stressed from several failed marriages”, to focus intense abuse and torture on Sylvia as an outlet for her anger and insanity. Baniszewski accused Syliva of stealing, humiliated her for having a boyfriend, and accused her of spreading rumors within Arsenal Technical High School that Baniszewski’s own daughters were prostitutes. Baniszewski and sometimes her daughters and other young teens from the neighborhood would beat Sylvia, tie her to beds, lock her in the basement of the home and throw her down stairs. They burned her with scalding hot water baths, rubbed salt in her wounds, and as part of one bit of court testimony, “forced her to remove her clothes and insert a glass Coca-Cola bottle into her.” Police reports also indicate Baniszewski once beat Syliva so hard in the face it broke her wrist. Baniszewski also forced Sylvia to ingest her own feces and urine while tied to a bed. Neighborhood boys, at Baniszewski’s encouragement, would later brand Sylvia’s skin with hot irons. Baniszewski would carve the phrase “I’m a prostitute and proud of it” into Sylvia’s abdomen using a sewing needle. At least 10 people were involved in beating and abusing Sylvia at one point or another over a single three-week period. Neighbors reported they could sometimes hear screams, but did nothing, as cultural norms at the time didn’t permit people to intrude in people’s assumed private affairs. On October 26, 1965, one day after Syliva made a failed escape out the front door of the home, she died of a brain hemorrhage, shock, and malnutrition at the age of 16. After realizing she was dead, Baniszewski sent a neighborhood boy to call the police from a payphone. When Indianapolis police arrived, Baniszewski handed them a letter she forced Sylvia to write a few days earlier that claimed she was a prostitute and that other boys, not Baniszewski, had burned, brandished, and abused her. Many of the neighborhood boys and other children involved were convicted of abuse, manslaughter, and murder. Baniszewski was convicted of first-degree murder and sentenced to life imprisonment. She was later granted a second trial in 1971 after the Indiana Supreme Court ruled the jurors could not have acted impartially given the media attention of the first trial. At the second trial she was again convicted of first-degree murder, but later released by the parole board for good behavior in 1985. She assumed a new name, as did some of her daughters, and moved to Iowa where she died of lung cancer in 1990. Sylvia’s case also pushed Indiana’s legislature to go further with mandatory reporting laws. When the federal government pushed states to define who mandatory reporters of child abuse should be, most states went with professionals like physicians. Indiana quickly defined “everyone” as a mandatory reporter of child abuse, which still stands today. In Indiana, anyone who suspects child abuse under any circumstance must make a report to law enforcement. There are penalties, including jail time, for failure to report. Reports can be made anonymously to the Indiana Child Abuse Hotline at 1-800-800-5556. In Indiana, anyone who suspects child abuse under any circumstance must make a report to law enforcement. To learn more about Sylvia’s CAC or make a donation, visit sylviascac.org.